Character: Delicious green tea character with notes of toast and a haunting finish. Most Japanese teas are made from well handled leaves and much of their elegance and style is due to the processing: steaming immediately after plucking and then air drying. Bancha or Sencha are the everyday green tea drinks of Japan. Ban 2 GO is one of the highest grades of Bancha. The leaves to produce Bancha are generally plucked after the new season and tend to be somewhat more coarse. 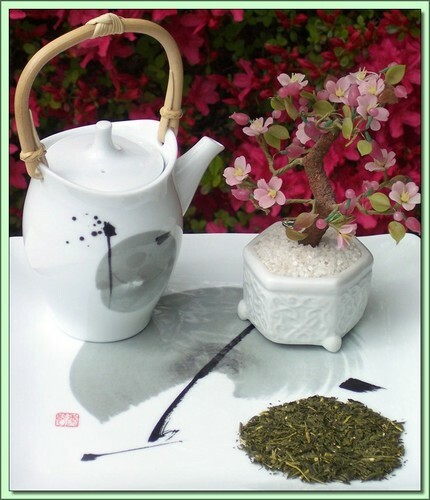 This however gives the tea its unique character and visual appearance. Since the leaves used to make Bancha are more coarse and contain some stalks and stems the resulting tea generally contains less caffeine or tannin then the finer grades of Japanese tea. Also the cup tends to be somewhat milder. Plucked and produced according to ancient Japanese tradition, this is the tea to recommend the next time you’re asked for something easy drinking, at any time of day. Produced under ISO 14001 Certified Environmental Management Standards. Hot Tea: This tea is best enjoyed by pouring 180F/82C water over the leaves (1 teaspoon per cup) for 3 minutes (longer=stronger). Don't remove the leaves. Can be infused repeatedly 2-3 times using higher temperatures & shorter infusions until flavor is exhausted.